To make the most informed decision regarding countermeasure selection, an agency should begin with the crash history data, observational information, and public notifications. After an analysis of that information, the local practitioner can choose appropriate safety treatments. The decision regarding which countermeasures to install to address a safety issue can be challenging. When appropriate, an agency should seek engineering expertise from a State or local engineer or through the State Local Technical Assistance Program (LTAP). For isolated high crash locations, the spot location approach is most appropriate. For those areas with a number of intersections with varying levels of crashes, systematic implementation of safety countermeasures is often the most effective approach. For locations that have yet to experience crashes, systematically applying safety treatments based on other criteria such as geometric configuration can prevent future crashes. For example, a high proportion of crashes may occur at intersections that share common geometric or operational elements.12 Installing the same low-cost countermeasures at multiple intersections (where appropriate) could, in many cases, improve the cost effectiveness of the safety improvement. The countermeasures presented here represent strategies that have been used by State and local jurisdictions to improve rural unsignalized intersection safety. 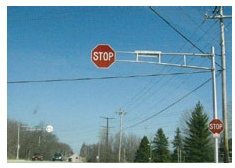 For the minor road stop approach of the intersection, two Stop Ahead signs (mounted left and right) and a painted stop bar are recommended to warn the driver of a stop condition ahead. The first Stop sign is installed at the traditional right side location; a second is recommended in the median (if available) of the approach. To accommodate this left-mounted Stop sign, a small mountable curb is suggested. This curb and associated pavement markings provide the motorist with additional information that he or she is entering an intersection. At a three-leg T-intersection, a Double Arrow Board is installed on the far side of the intersection facing the minor approach to warn drivers that the roadway does not continue straight past the intersecting roadway. For the major road approach, Intersection Ahead warning signs are recommended (mounted left and right). In addition, it is recommended that street name signs be placed underneath each intersection warning sign. These street name plaques provide the driver with additional information about the street the motorist is approaching so he or she can make an early decision regarding potential turning movements. 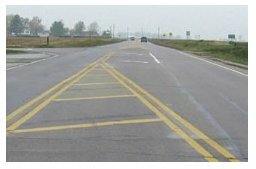 The installation of edge line and centerline pavement markings are also recommended on the main line approach, with a gap in the centerline pavement marking to indicate the presence of an intersecting roadway. Even if all signs cannot be feasibly installed at a given intersection, enhancement of traffic control devices with installation of part of this sign and pavement marking package can provide some level of improved safety. In addition to this basic package, supplemental enhancements can be installed as needed. 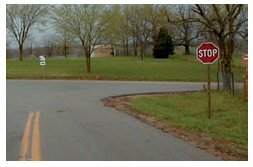 For example, Stop signs can be oversized (typically 48 inches wide, but sometimes up to 60 inches is acceptable), with a reflective red strip on the post, or with a flashing red beacon installed above the sign to increase recognition of the intersection. Flashing amber beacons and yellow reflective post strips can be added to warning signs. Additional enhancements to pavement markings include raised pavement markers (RPMs) and pavement legends, including the word "STOP" painted on the roadway just before the stop bar. For intersections identified for safety improvements, additional analysis may be needed to determine the most appropriate countermeasures to reduce future crashes. The information compiled from the database will help determine, for each intersection, the contributing crash and roadway attributes that will form the foundation for selecting appropriate countermeasures. This section contains specific information on a number of select countermeasures to prevent future crashes at unsignalized intersections. These individual treatments should be considered in addition to, or in lieu of, the basic package discussed previously to address specific safety issues. This does not represent an all-inclusive list of intersection countermeasures; for additional countermeasures see the following documents. NCHRP Report 500, Volume 5. "A Guide for Addressing Unsignalized Intersection Collisions." Federal Highway Administration, "Objectives and Strategies for Improving Safety at Unsignalized and Signalized Intersections." 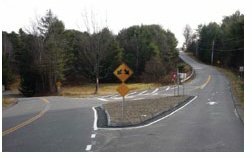 Federal Highway Administration, "Intersection Safety Strategies Brochure." Crash Type Addressed – In order to effectively reduce the number and severity of intersection crashes, it is necessary to match countermeasures to the crash types they are intended to address. For example, if the most frequent crash types are angle crashes due to poor sight distance with an overgrowth of foliage, the most effective countermeasure would be to clear the intersection's sight triangles to improve sight distance. Where to use – Some countermeasures will have specific types of intersections where their benefit is greater than others. For example, the addition of a turn lane is most likely to benefit an intersection with a high number of turning vehicles. Why it works – A discussion of the benefit of a countermeasure is important to determine its appropriateness to address certain intersection crash types. Timeline for Implementation – This category refers to the relative approximate time it can take to implement the countermeasure. Estimated cost – Most countermeasures included in this report are considered low-cost; low to moderate cost; or moderate cost. These categories represent relative costs of the countermeasures to each other. Costs can vary considerably due to local conditions. The effect of a countermeasure on crashes can also be expressed as a Crash Modification Factor (CMF). It is defined mathematically as 1 – CRF. In the example above, a 20 percent reduction of crashes is represented by a CMF of 0.80. This effect of the countermeasure can be calculated by multiplying its value by the number of current crashes to determine an expected number of future crashes. For instance, if there are 50 current crashes, by multiplying the CMF of 0.80 times 50, one could expect 40 future crashes. Crash type addressed: Right-angle and rear-end crashes attributed to drivers unaware of the intersection. Where to use: Unsignalized intersections that are not clearly visible to approaching motorists, particularly approaching motorists on the major road. The strategy is particularly appropriate for intersections with patterns of rear-end, right-angle, or turning crashes related to lack of driver awareness of the presence of the intersection. Why it works: Installation of signing in advance of and at intersections will provide approaching motorists with additional information at these locations. Drivers should be more aware that the intersection is coming up, and therefore make safer decisions as they approach the intersection. Crash type addressed: Right-angle crashes attributed to drivers unaware of the intersection or failing to stop at the Stop sign. Where to use: All stop-controlled intersections should be addressed with this treatment. Damaged signs should be replaced without undue delay, and a suitable schedule for inspection, cleaning, and replacement of Stop signs should be established. Why it works: The Stop sign is often the only indication to drivers that conflicting traffic could be approaching at an intersection. Maintenance of Stop signs must be at a high standard to ensure that the effectiveness of the signs is retained. Where to use: Minor road approaches where conditions allow the stop bar to be seen by an approaching driver at a significant distance from the intersection. Locations should be identified by patterns of crashes related to lack of driver recognition of the intersection. Why it works: Providing visible stop bars on minor road approaches to unsignalized intersections can help direct the attention of drivers to the presence of the intersection. Where to use: Unsignalized intersections with patterns of right-angle crashes related to lack of driver awareness of the presence of the intersection. In particular, it might be appropriate to use this strategy at the first stopcontrolled approach (possibly of a series) located on a long stretch of highway without any required stops, or at an intersection located after a sharp horizontal curve. Why it works: Installation of an additional Stop sign above the roadway will provide approaching motorists a clear message that they must stop at the intersection. This reduces the opportunity for right-angle crashes attributed to a driver inadvertently running the Stop sign. Crash type addressed: Right-angle and rear-end crashes attributed to drivers unaware of the intersection or failing to stop at the Stop sign. Where to use: Unsignalized intersections with patterns of right-angle crashes related to lack of driver awareness of the intersection on an uncontrolled approach and lack of driver awareness of the Stop sign on a stopcontrolled approach. 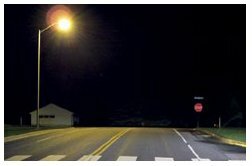 Why it works: Flashing beacons provide a visible signal to the presence of an intersection and can be very effective in rural areas where there may be long stretches between intersections as well as locations where nighttime visibility of intersections is an issue. 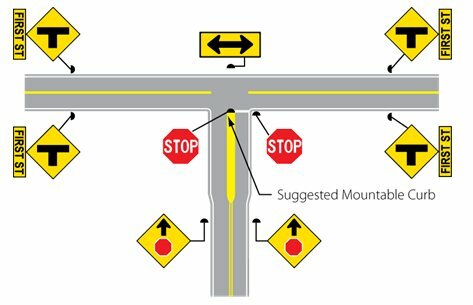 Where to use: Minor road approaches to unsignalized intersections where the presence of the intersection or the stop sign is not readily visible to approaching motorists. The strategy is particularly appropriate for intersections where the speeds on the minor road are high. Why it works: The installation of splitter islands allows for the addition of a stop sign in the median to make the intersection more conspicuous. Additionally, the splitter island on the minor-road provides for a positive separation between turning vehicles on the through road and vehicles stopped on the minorroad approach. Crash type addressed: Right angle and roadway departure crashes attributed to motorists unaware of Stop or Yield signs as they approach an intersection. Where to use: Transverse rumble strips are installed in the travel lane for the purposes of providing an auditory and tactile sensation for each motorist approaching the intersection. 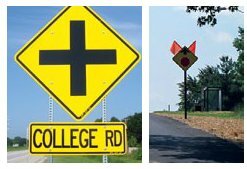 They can be used at any stop or yield approach intersection, often in combination with advance signing to warn of the intersection ahead. 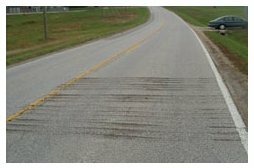 Due to the noise generated by vehicles driving over the rumble strips, care must be taken to minimize disruption to nearby residences and businesses. Why it works: When motorists are traveling along the roadway, they are sometimes unaware they are approaching an intersection. This is especially true on rural roads, as there may be fewer cues indicating an intersection ahead. Transverse rumble strips warn motorists that something unexpected is ahead that they need to pay attention to. Crash type addressed: Right-angle and left-turn crashes attributed to poor sight distance at the intersection. Minor road vehicles could be turning right, left, or going straight. Where to use: Unsignalized intersections with restricted sight distance and patterns of crashes related to lack of sight distance where sight distance can be improved by clearing roadside obstructions without major construction. 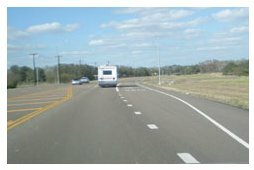 Why it works: By removing sight distance restrictions (e.g., vegetation, parked vehicles, signs, buildings) from the sight triangles at stop or yield-controlled intersection approaches, drivers will be able see approaching vehicles on the main line, without obstruction and therefore make better decisions about entering the intersection safely. Crash type addressed: Rear-end crashes attributed to right turning vehicles hit from behind. Where to use: Unsignalized intersections with a high frequency of rear-end crashes resulting from conflicts between (1) vehicles turning right and following vehicles and (2) vehicles turning right and through vehicles coming from the left on the cross street. Why it works: Providing right-turn lanes at intersections will allow vehicles that are traveling through the intersection to continue without stopping while turning vehicles will use the right-turn lanes. Assuming turn lanes are of adequate length, vehicles will not be stopped on the travel lanes which allows for through traffic to continue without stopping for vehicles turning at an intersection. Crash type addressed: Rear-end crashes attributed to left turning vehicles hit from behind. Where to use: At three-legged unsignalized intersections on two-lane highways with moderate through and turning volumes, especially intersections that have a pattern of rear-end collisions involving vehicles waiting to turn left from the mainline. Why it works: Providing bypass lanes on the shoulder will allow vehicles that are traveling through the intersection to continue without stopping, thus reducing the potential for stopped vehicles waiting to make the turn from being hit from behind. Where to use: Unsignalized intersections with a high frequency of crashes resulting from the conflict between (1) vehicles turning left and following vehicles and (2) vehicles turning left and opposing through vehicles. Why it works: Providing left-turn lanes at intersections will allow vehicles that are traveling through the intersection to continue without stopping while turning vehicles will use the left-turn lanes. Assuming turn lanes are of adequate length, vehicles will not be stopped on the travel lanes which allows for through traffic to continue without stopping for vehicles turning at an intersection. Crash type addressed: Head-on and angle crashes due to left-turning motorists pulling out in front of opposing through traffic. Where to use: Unsignalized 4-legged intersections with a high frequency of crashes between vehicles turning left and opposing through vehicles. This treatment can be applied at intersections on divided highways with medians wide enough to provide the appropriate positive offset, and also on approaches without medians if sufficient width exists. 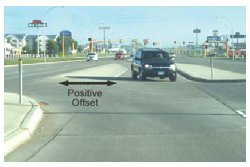 Why it works: Positive offset turn lanes provide the left-turning motorist a line of sight to opposing through vehicles. Instead of attempting to look around opposing left-turning vehicles, the motorist can clearly see oncoming traffic. 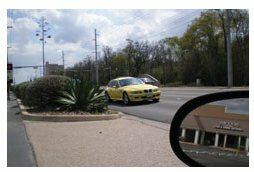 Crash type addressed: Skew reduction or elimination is appropriate at unsignalized intersections with a high frequency of crashes resulting from insufficient sight distance caused by the skew. *The CRF varies by the degree of skew. 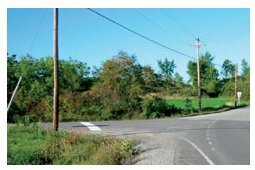 Where to use: Skew realignment is appropriate at unsignalized intersections with a high frequency of crashes resulting from insufficient intersection sight distance and awkward sight lines at a skewed intersection. 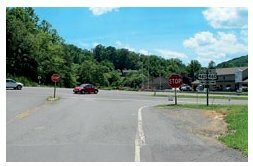 Why it works: Reducing or eliminating the skew at intersection approaches helps address problems like vehicle alignment, long exposure in the intersection, and potential driver confusion. Treatments include pavement markings, channelizing islands, and realignment. Crash type addressed: Right-angle, left-turn, and rearend crashes attributed to dark conditions. Where to use: Unsignalized, unlit intersections with substantial patterns of nighttime crashes. In particular, patterns of rear-end, right-angle, or turning crashes on the major road approaches to an unsignalized intersection may indicate that approaching drivers are unaware of the presence of the intersection. Why it works: At night in rural areas, the only source of lighting for roadways is generally provided by vehicle headlights. Roadway lighting allows for greater visibility of the intersection which makes the intersection more conspicuous to motorists and provides aid in helping drivers determine their paths through the intersection by making signs and markings more visible. Crash type addressed: Right-angle and rear-end crashes attributed to poor sight distance. Where to use: Unsignalized intersections with restricted sight distance due to horizontal and/or vertical geometry and with patterns of crashes related to that lack of sight distance that cannot be ameliorated by less expensive methods. Why it works: Although changing alignment is a high cost treatment, in some cases sight distance is restricted by horizontal and vertical curvature. 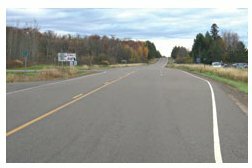 Straightening a roadway will increase sight distance and allow for better visibility of other vehicles and the intersection itself. Crash type addressed: Right-angle and left-turn crashes attributed to motorists unaware of Stop or Yield signs, unaware of conflicting traffic at the intersection, or misjudging gaps in the mainline traffic. Where to use: Roundabouts can be installed in a wide variety or rural locations. In particular, unsignalized intersections with a history of right angle crashes are good candidates for roundabout installation. Sufficient agency-owned right-of-way is necessary to install the roundabout, as its geometric footprint differs from a traditional intersection. 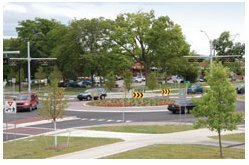 Why it works: Roundabouts are a proven safety treatment for intersection crashes due to a reduced number of conflict points and reduced intersection speeds. A motorist approaching the intersection looks in only one direction for conflicting traffic before entering the roundabout. The geometry of the approach legs and the inner circle keep speeds low, reducing the severity of any crash that might occur. Highway Safety Improvement Program (HSIP). The HSIP is a Federal Aid program focused on improving traffic safety on all public roads with infrastructure solutions. High Risk Rural Roads Program (HRRRP). The HRRRP is a set aside from the HSIP funds. It focuses on addressing rural road safety needs on rural major and minor collectors and local rural roads with construction and operational improvements. Safe Routes to School (SRTS) Program. The SRTS Program empowers communities to make walking and bicycling to school a safe and routine activity. The program makes funding available for a wide variety of programs and projects, from building safer street crossings to establishing programs that encourage children and their parents to walk and bicycle safely to school. In addition, potential access to other transportation funding sources (not directly focused on safety) for safety projects may also be available. Further information about Federal funding sources can be accessed at the FHWA Office of Safety website: http://safety.fhwa.dot.gov. Outside the Federal funding sources, State safety funds may be available to a jurisdiction for intersection safety projects. 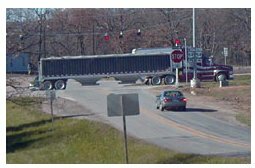 Action: Contact the State DOT or LTAP Center to find out more information about how Federal and State safety funds are used and could potentially be used to support safety projects at local intersections.